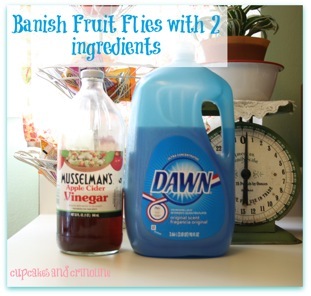 Here's a Sure-Fire DYI Fruit Fly Trap! Nola sent me information she found in July on the great website, Heirloom Organics, on successfully eliminating fruit flies. The timing is perfect because this is fresh fruit season and these little guys seem to come out of nowhere and "bug" the snot out of me! And what makes it extra fun is how quickly they multiply-I kill 4 and 25 come to the funeral! Can you relate at all? They have an extremely short life span, growing from their egg stage to adult stage in just 8-10 days and they thrive in a moist environment, which is why you often find them near the kitchen sink or garbage disposal. They are hard-wired to seek out and find fermenting (aging) fruit. They can smell it for miles, and are brilliant at finding any way into your home. Because of their minuscule size, they can gain access through window screens or small gaps under windows, etc. They're even known to catch a ride home with you from the grocery store. It's not uncommon for fruit fly eggs to be loitering in the fruit that you've purchased. And that little detail explains why they sometimes seem to appear out of nowhere in your once fruit fly-free home. Once inside your home, they will find that bowl of fruit on your kitchen counter, reproduce like mad, and completely take over. And talk about clever, they don't even need fruit in order to reproduce and continue on their life cycle! They can reproduce and lay eggs in your garbage disposal, that sour old kitchen sponge, under the lining of your kitchen trash can or in the trash can-pretty much anywhere that's moist! Pour 2/3 cup of vinegar into the canning jar. Add a few drops of dish detergent in with the vinegar. Create a cone from the 8.5" x 11" sheet of paper. Place cone into the jar, being careful that it doesn't touch the liquid. (The purpose of the paper cone is to help trap the fruit flies in the canning jar until they come into contact with the Apple Cider Vinegar/dish detergent mixture. Place jar with inserted cone on your counter near your fruit dish. Every 1-2 months wash the jar and replace liquid mixture.